Things get a bit deep this week, and I like how that can be interpreted in all sorts of ways. 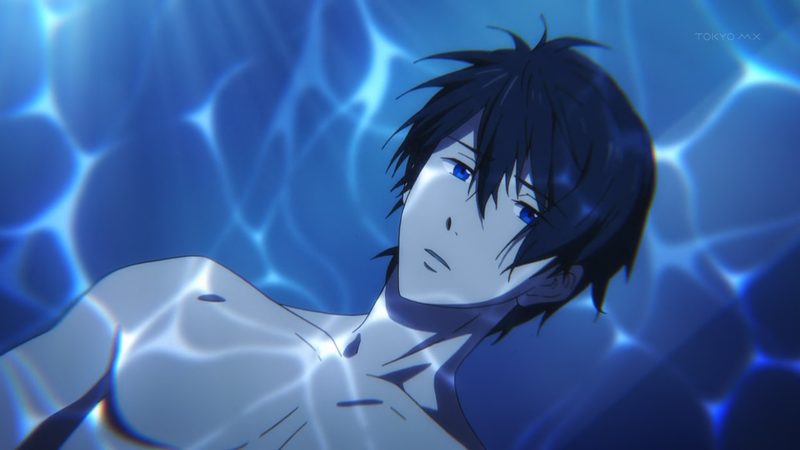 After the result of last week’s race, Haru is left to ponder the meaning of life, which more or less encapsulates swimming for him. Previously, he’s never cared about winning and yet losing to Rin has him in such a rut. In any sort of movie or anime, the moral of the story is to put fun over actually winning. This philosophy is particularly potent because those who do typically end up winning anyway. Unfortunately, Haru only had half of the philosophical formula down. He wholeheartedly believes that swimming is something that sets your soul free, but he forgot that it’s also a way to connect with the people closest to you. Swimming with others is what makes it all worth it, at the risk of sounding cliche. But hey, it’s a sports anime so what do you expect? Makoto, Nagisa, and Rei even confront Rin about it. It’s interesting how the two most passionate swimmers are having the hardest time discovering what their true reason for swimming is. 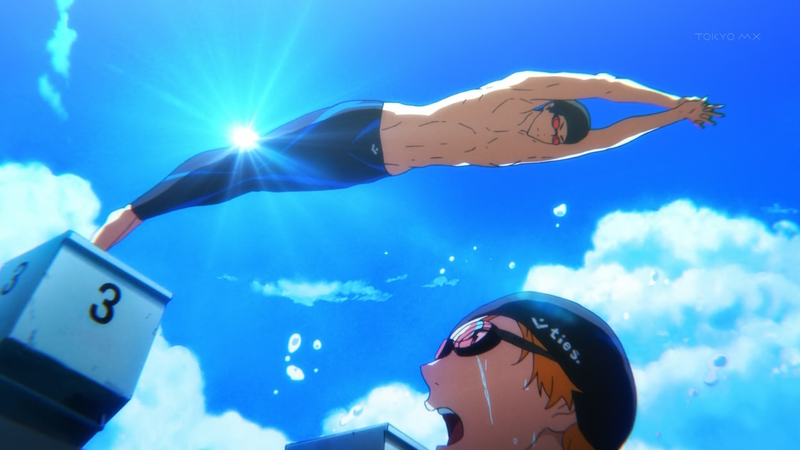 In the previous episode, it’s shown that Rin swims to live out his father’s dream, but I’m starting to wonder if there’s more to it. I mean he does it well, but he never seems happy about it. I’m sure the series is building up to the point where he’ll realize this fact. In the meantime, we’re treated to a fantastic medley relay race and is pretty much what I’ve been waiting for all season. Sure, the freestyle faceoff between Rin and Haru was exciting, but the way the medley race is built up makes it much more satisfying, especially with Rin watching in amazement. As he watches, he recalls their younger selves and how they’ve never really changed. He’s the only who has, and Rei is, well, Rei. 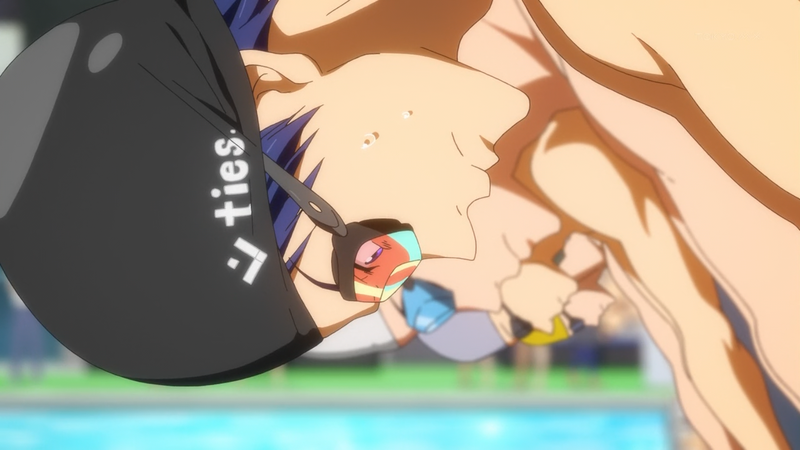 I laughed when Rin totally insulted his butterfly. Also, I’ve said it before, but the BGM is very nice. It’s varied, and the triumphant string music during the medley race made it ten times more emphatic. But who won? We’ll have to wait another week for those results. I’m not sure what I’m more excited for, the rest of the race or the Squid Festival.